You've heard the songs. You've known the authors. You've downloaded the customs. You've played the hits, deep cuts, and everything in between. You've known C3 as the go-to for the biggest, best, and most diverse plethora of amazing customs created by our very talented members from the small one-off singles to the massive projects and events. Now we're announcing a brand-new project we're super excited about. The box set will consist of ten records. Each record will consist of ten songs and each record will increase in song difficulty with a varied set of songs from different genres, decades, and authors. There will be only one song per artist (sorry U2, you'll only get one song this time). 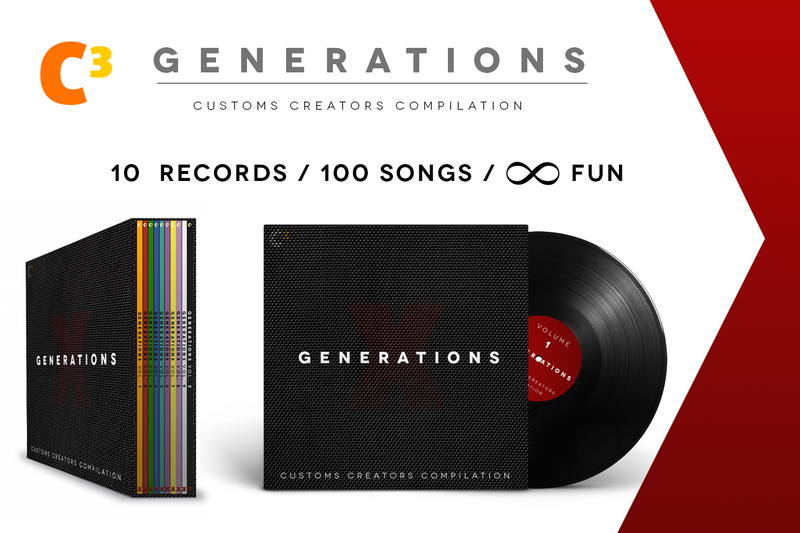 Like any other compilation album, C3 Generations will be released all at once. On September 15th you will be able to download all songs to enjoy on your Rock Band 3 console of choice. C3 has been around for the better part of six years, it's about time we released a compilation showcasing our incredible authors through a variety of great music. We look forward to showing you more but for now, sit back and get hyped! 8.) Sufjan Stevens – Come On! Feel the Illinoise! Ooooooooooooooooooooooooooooooh! This is gonna be fun! Can't wait to contribute to this! Dude, great press release art. I'm super stoked for this! Sweet artwork! Excited to see which songs this brings! So excited to see the setlist!! Ok, ok,........everybody knows now.....I done did a premature hypeaculation.......Damn! Edited by Funk Meister Freud, July 2, 2018 - 05:23 AM. My only question, will some artists be debuting? A question: is this a compilation of existing customs or new compositions? There is bound to be new artists among the fold, and tho' the list has not yet been finalized, they're all new customs. Marvellous! Another awesome undertaking by the C3 massive. Got my fingers crossed that KROKUS Screaming in the Night makes the cut. Oh how I enjoy boxsets teehee. Havn't a clue. I do know what a spotify is. Forgot to mention, special thanks to farottone for the awesome graphic banner! Your responses are making me all the more excited to get this underway. Thank you for your support!